Simulcast airing of The Rise of the Shield Hero continues, while Second Part of Attack on Titan's third season starts on April 29. Southeast Asian anime channel ANIPLUS Asia has announced on Tuesday the first two of their simulcast anime titles for the Spring 2019 season, which are AFTERLOST (Shoumetsu Toshi) and Isekai Quartet. AFTERLOST will premiere on April 8, which will air every Mondays at 12:00am (11:00pm JKT/BKK), within an hour after its initial Japanese telecast. Encore telecast on the same day at 09:00pm (08:00pm JKT/BKK). Isekai Quartet will premiere on April 10, which airs every Wednesdays at 12:30am (11:30pm JKT/BKK), within an hour after its initial Japanese telecast. Encore telecast on the same day at 06:00pm (05:00pm JKT/BKK). The two upcoming shows will be in addition to the simulcast airing of the Second part of Attack on Titan’s third season, which will start on April 29. The simulcast airing of The Rise of the Shield Hero will continue in the Spring season, which airs every Wednesday nights. More simulcast titles are set to be announced in the coming days. AFTERLOST, also known by its Japanese title Shoumetsu Toshi, is an upcoming anime adaptation of a mobile game by Wright Flyer Studios and GREE first released in May 2014. The anime adaptation will be directed by Shigeyuki Miya, who previously worked in Buzzer Beater and Blood Lad, while All Out!! scriptwriter Shingo Irie handled the series composition, and Mobile Suit Gundam 00’s Kenji Kawai handled the music. Tomoyuki Shitaya, who previously worked in Food Wars: Shokugeki no Soma, will handle character designs, which will be produced by Madhouse. 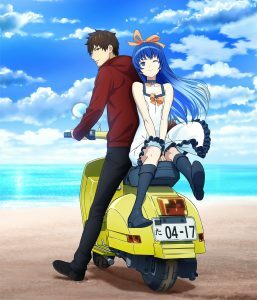 The upcoming anime’s Japanese voice cast will be lead by Kana Hanazawa (“Kosaki Onodera”, Nisekoi: False Love) as “Yuki” and Tomokazu Sugita (“Gintoki Sakata”, Gintama) as “Takuya”. 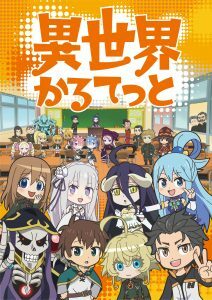 Isekai Quartet is an upcoming crossover anime of Kadokawa’s isekai-themed light novel series, like Overlord, KonoSuba: God’s Blessing on this Wonderful World!, Re:Zero – Starting Life in Another World and The Saga of Tanya the Devil. One day, a mysterious switch appeared. Upon pressing, multiple characters are transported into an alternative world. 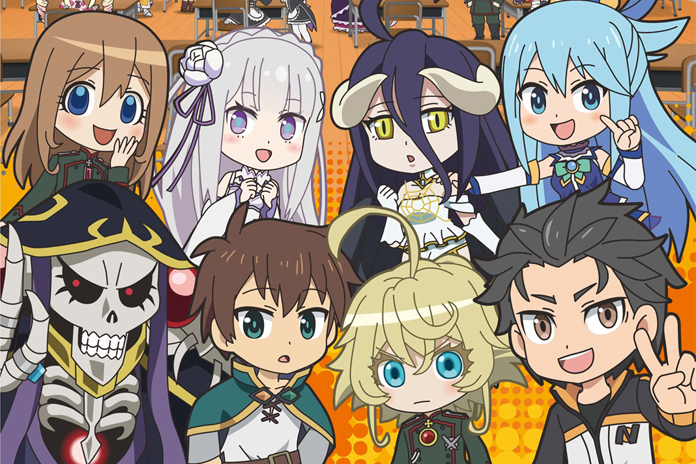 Isekai Quartet will reunite director Minoru Ashina and character designer Minoru Takehara, who previously worked on anime titles like Agriculture Angel Baraki and Lord Marksman and Vanadis, which will be produced by Studio Puyukai. ANIPLUS Asia is available in the Philippines on SKYcable Channel 139 in Metro Manila, CAMANAVA, Rizal, Bulacan and Laguna, G Sat Channel 66 in High Definition, and in select provincial cable providers around the country. For more details on the channel, please visit aniplus-asia.com.